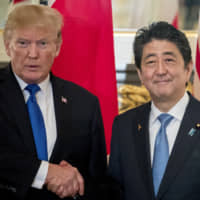 Yomiuri manager Tatsunori Hara assured the media everything was all right during spring training as the Giants sputtered to six straight losses at the end of the exhibition season. 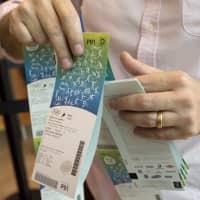 The games began to count on Friday and for one night, opening night, at least, everything really was OK in Yomiuri Land. Yoshiyuki Kamei hit a two-run home run, Tomoyuki Sugano shut down a pair of potential rallies, and the three-time defending Central League champions got the new year off to a winning start with a 3-2 victory against the Yokohama BayStars in front of a crowd 45,524 at Tokyo Dome. Kamei’s home run came in his first at-bat of the season, and was also the first of the year in NPB. “I hit the ball well and knew it was gone as soon as it left the bat,” Kamei said. Hisayoshi Chono also drove in a run with a double in the bottom of the first. Yomiuri’s batters didn’t come up with many hits, big or of any other variety, in the victory. 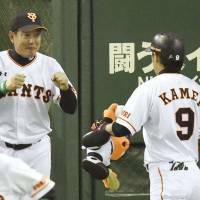 The Giants were outhit 9-4, with only one base knock, a single by Hirokazu Ibata in the eighth inning, coming after the second frame. Hayato Sakamoto, who singled in the first, had the team’s other hit. Sugano (1-0) was the winning pitcher on opening night for the second straight season, allowing one run on seven hits in seven innings on the mound. Sugano struck out five and walked one. “I didn’t do well during the exhibition season, so I was a little nervous at first, but I was OK after the first inning,” Sugano said. 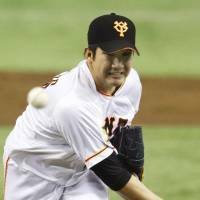 Sugano gradually lost steam as the innings wore on and was in serious trouble on two occasions. He escaped a no-out, bases loaded jam in the fifth and loaded the bases with one away in the seventh, before being bailed out by his defense. Former starter Hirokazu Sawamura got a save in his debut as the Kyojin‘s new closer, but had to pitch around a solo homer by second-year player Taiki Sekine in order to nail down the victory. Sekine’s home run was the first of his career. Yoshitomo Tsutsugo hit a solo home run for the BayStars in the fifth, becoming the first Yokohama player to go deep in a season opener since Shuichi Murata did it against the Hanshin Tigers in 2010. BayStars starter Yasutomo Kubo was charged with the loss, allowing three runs on three hits over four innings. Kubo (0-1) struck out two and walked two. Chono drove in Yomiuri’s first run, connecting on a 115-kph slider up in the zone for an RBI double that drove in Sakamoto from second. 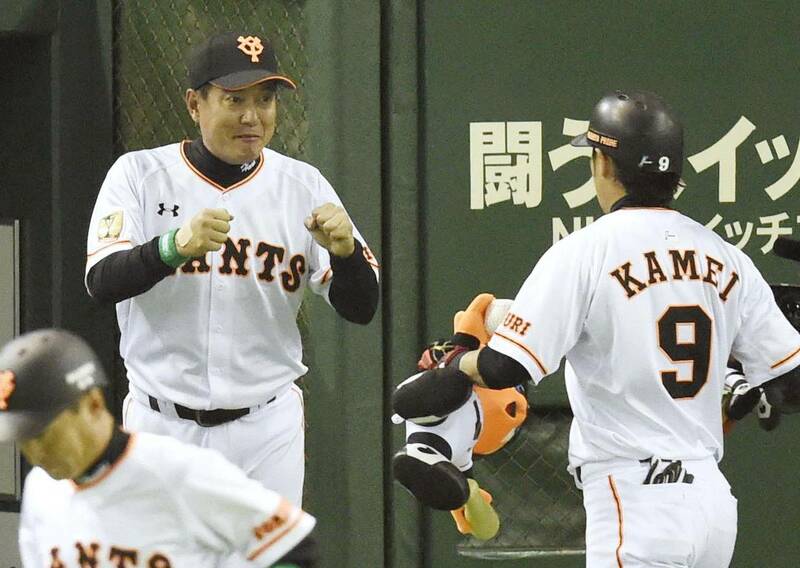 Giants outfielder Yoshinobu Takahashi drew a walk to begin the second, and Kamei got all of a 134-kph fastball, another pitch left up, for his two-run home run to right that put the Giants ahead 3-0. “No doubt Kamei’s homer gave us the early 3-0 lead and the confidence to go on and win,” Hara said. Tsutsugo got the BayStars on the board in the fifth with his homer to right. The hit seemed to tilt the momentum in Yokohama’s favor, and Jose Lopez, Aarom Baldiris and Toshihiko Kuramoto reeled off consecutive singles to load the bases with no outs. Sugano wrested control back for Yomiuri and preserved the two-run lead by retiring the next three BayStars in order. Baldiris singled to begin the seventh, and Kurobane connected on a one-out single later in the inning. Toshitaka Goto then drew a walk to load the bases with one out. Sugano escaped again, this time thanks to left fielder Takahashi catching a fly ball from Takahiro Ishikawa and making the throw to home in time for catcher Seiji Kobayashi to tag out Baldiris and end the inning. Sawamura got two quick outs to start the ninth, but Sekine made things tight with his solo homer, which cut the lead to one run. 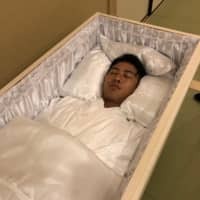 Sawamura recovered and retired the next batter to end the game. The two teams will square off again Saturday at the Big Egg. 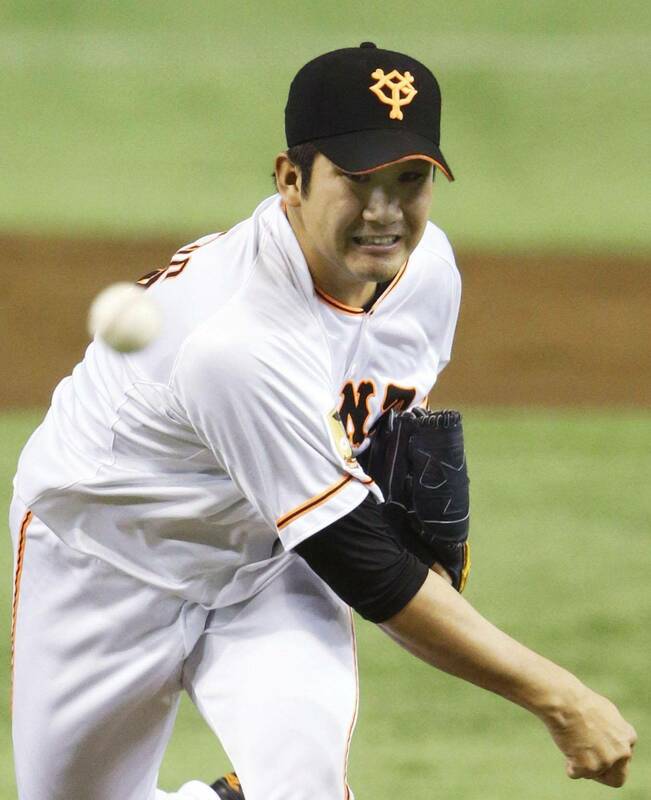 Aaron Poreda will make his first career NPB start for the Giants, and Shun Yamaguchi will toe the rubber for Yokohama. Osaka — Matt Murton’s two-out, 10th-inning single drove in the winning run and the Hanshin Tigers overturned a three-run deficit in the eighth to walk off with a 5-4 victory over the Chunichi Dragons on Friday. At Hiroshima’s Mazda Stadium, Lastings Milledge’s two-out, two-run triple propelled Tokyo Yakult to victory over Hiroshima in the 11th inning. At Tokorozawa’s Seibu Prince Dome, Seibu began its 2015 campaign by blanking Orix. Second-year slugger Ernesto Mejia broke the ice in the sixth inning with a two-out RBI single off Brandon Dickson to give Seibu the lead en route its first victory on Opening Day in four years. Mejia, who has struggled at the bat in his first encounter with Japan’s preseason, made fun of his own habit of looking for fastballs in clutch situations. After taking a breaking ball for ball one, he swung and missed at a fastball from Dickson. “You get old, you start learning stuff,” said the 29-year-old Mejia, who joined the Lions last summer after a decade in the Atlanta Braves organization. Lions submariner Kazuhisa Makita, handed the Opening Day start after an injury to ace Takayuki Kishi, had exchanged zeroes with Dickson for five innings before weathering a jam in the sixth. With one out and runners on second and third, Makita shattered Tony Blanco’s bat, as the former Central League batting champ and RBI king flied out to short. Makita hustled to first for the final out before his teammates scratched out a run in the home half of the sixth. Mejia, who had rollercoaster game defensively at first, teamed with Makita to end the Buffaloes’ sixth on a roller hit between him and the mound. Makita made for the ball, but at the last instant veered for first to take Mejia’s throw and barely get the runner to save a run. “I screamed at him to cover, but I don’t know if he heard me, but he did a great job of covering the base,” Mejia said. Makita (1-0) allowed five hits over seven innings, struck out four and walked one. Dickson (0-1) also yielded five hits over seven innings. The 1.95-meter right-hander struck out six and walked two. Dickson, himself starting in place of rehabilitating Buffaloes ace Chihiro Kaneko, gave up a leadoff double to Shogo Akiyama after starting off with good command of his fastball and breaking ball. After a fly to right moved Akiyama to third, Dickson struck out 2013 PL RBI champ Hideto Asamura swinging and walked Takeya Nakamura to bring up Mejia, who grounded a 1-1 breaking ball into right for an opposite-field single and a 1-0 Lions lead. Tomomi Takahashi, who saved 29 games last season and was runner-up for PL rookie of the year last season, closed out the Buffaloes in ninth after reliever Tatsushi Masuda threw a scoreless eighth. At Fukuoka’s Yafuoku Dome, Hideaki Wakui survived six hits, two hit batsmen and two walks to earn the win in six scoreless innings as Chiba Lotte defeated Tadashi Settsu (0-1) and defending Japan Series champion Softbank. At Sapporo Dome, Hokkaido Nippon Ham’s Shohei Otani allowed a run in 5-2/3 innings and struck out six to earn his first Opening Day victory. Newcomers Jeremy Hermida and Brandon Laird each singled and later scored on a throwing error as the Fighters rallied from behind in the fifth.